Yesterday I was interviewed on Lifeline with Craig Roberts , a Christian radio talk show in Northern California. In addition to talking about my book Alone with a Jihadist we also had a healthy debate on Pacifism Vs. Just War theory, with me advocating the former and Craig Roberts advocating the latter. All in all, it was a very good discussion, and I appreciated that Craig kept the dialogue civil, unlike experiences I’ve had in the past with Christian talk show hosts. Still, one thing I figured out is that when you’re a guest on a program and you’re arguing a different perspective than the host, the deck is always stacked in favor of the host, mainly because once you’ve made your point, the host can respond and then go to a commercial break. You never get the last word. The interview was supposed to last 45 minutes, but Craig kept me on for an additional 15 minutes at the top of the hour. I had a hugely embarrassing moment when I thought that we were still in dialogue mode, and it turned out that Craig was making his closing remarks. I kept trying to cut in till the last moment before he ended the segment–something I hope I never do again! You live and you learn. All in all, I got most of my points in. Those of you that know me, or have had robust discussions with me personally on some of these issues, you know that my brain goes about 1,000 miles a minute. For every point made, I usually have about 5-10 counter points in my head. The problem is, when you have so much information, it’s hard to reduce your arguments to sound bites and get every point in. So, in the interest of redeeming myself, here are some of the points I didn’t get a chance to say. 1. Craig asked the question of what do we do with all of the warrior imagery in Scripture, in particular the Spiritual Warfare imagery that the Apostle Paul uses and the passages in Scripture portraying God as a warrior. What I said was that the warrior imagery that Paul used is meant to be taken spiritually, and nothing else. In fact, Paul explicitly says “The weapons of our warfare are not carnal” (I Corinthians 10:4). What I didn’t get around to saying was that one of the reasons why Scripture consistently portrays God as a warrior is to illustrate the point that covenant people are supposed to trust in God, not the sword. In fact, the prophet Ezekiel specifically lists relying on the sword as one of the reasons why God sent the Jews to Babylon in judgment (Ezekiel 33:26). One of the constant themes in the Hebrew Scriptures (Old Testament) is that God got ticked off at His people when they didn’t trust Him to fight their battles for them, but instead trusted in their own military might. I find it odd that not once have I ever heard the theme of “repenting for our reliance on our military might” come up in a major prayer and repentance conference here in the U.S. We repent for a lot of other things, but never for trusting in the sword to save us. Interestingly, the period of the Pax Romana, a two hundred year period of relative peace and security of the Roman Empire, ended right around the time the first Christian soldier is recorded. Before then, Christians saw that their primary duty to the empire was to pray for the peace and well-being of their fellow Roman citizens. 2. I made a lot of points about why the Bible should be read through the lens of Jesus, and why Christians are under the Law of Christ, not the Law of the Old Covenant. For example, Hebrews 8:13 calls the Old Covenant obsolete. Jesus said, “You’ve heard that it was said an eye for an eye, but I say unto you….” still the counter-argument was that Jesus said “I’ve not come to destroy the law but to fulfill the law” (Matthew 5:7-18) What I didn’t get a chance to say is that when it comes to Biblical interpretation, when you have numerous verses that clearly say one thing and one verse that seems to contradict the numerous verses, you don’t throw out the numerous verses in favor of the one, like many people do in this case. There are a myriad interpretations of this verse ( I like the one that says that if you obey Jesus, then you’re fulfilling the Spirit of the Law, which is what Jesus never intended to abolish), the fact is still the same. Jesus said, “If you love Me, keep My commandments” (John 14:15) (italics emphasis mine). The question of whether a Christian should participate in violence should be determined by Jesus, not by what God commanded Israel to do in the Old Testament era. 3. Craig used the cleansing of the temple to show that Jesus was, in fact violent. I pointed out that Isaiah 53:9 specifically says that Jesus never did anyone violence. The example of Jesus cleansing the temple is more of a basis for an aggressive activism against injustice, like what was displayed in the civil rights movement. I wish I would have elaborated on that point of non-violent direct action as a way of addressing injustice in the world. Besides, isn’t it a bit of grasping for straws to use a civil protest as a pretext for flying over skies and dropping bombs? 4. Craig made the point that the teachings of the Sermon on the Mount were meant to be limited to personal interactions. I never got a chance to rebut this, so here’s my partial answer now. I think the distinction between personal enemies and national enemies is an artificial one, especially when you look at the political backdrop of the New Testament. One of the over-arching themes that we see in the New Testament is that Jesus and the Apostles did not want their followers participating in a rebellion against Rome. The Romans did some awful things, both in their brutal persecution of Christians and also in the way they put down rebellions–like slaughtering and crucifying civilians–yet still the answer that Jesus and the Apostles gave was Christians were not to participate in violence even against such monstrous evil as what the Roman Empire was doing to many of its citizens. In fact, the very context of the Romans 13 passage, which many just war theorists use as the ace in the hole argument, is don’t rebel against Rome! Especially if you back up a few verses to the last few verses of chapter 12, you’ll see that the entire context of Romans 12:14-13:7 is that Christians should be kind and gentle, and never exacting vengeance even on their worst political enemies! There’s a lot, lot, lot, more I could say on these points, but this post has been longer than normal as is. Thank you Craig for keeping the dialogue respectful. To my readers, keep your eyes on Jesus, the author and finisher of our non-violent faith! I’ve been accused of only going after the extremism and violent rhetoric of one side. Here’s my chance to say, for the record, I don’t approve of this either. 9 militia members charged in police-killing plot–should these "terrorists" be tortured? For my 6 out of 10 white evangelical friends that support torture, I have a few questions for you. 1. Are the people in this story terrorists? 2. If so, should they be tortured? 3. If they had a different color of skin and professed a different religion (read: Islam), would your answer be the same? DETROIT – Nine suspects tied to a Midwest Christian militia that was preparing for the Antichrist were charged with conspiring to kill police officers, then attack a funeral using homemade bombs in the hopes of killing more law enforcement personnel, federal prosecutors said Monday. The Michigan-based group, called Hutaree, planned to use the attack on police as a catalyst for a larger uprising against the government, according to newly unsealed court papers. U.S. Attorney Barbara McQuade said agents moved on the group because its members were planning a violent reconnaissance mission sometime in April. Members of the group, including its leader, David Brian Stone, also known as “Captain Hutaree,” were charged following FBI raids over the weekend on locations in Michigan, Ohio and Indiana. The idea of attacking a police funeral was one of numerous scenarios discussed as ways to go after law enforcement officers, the indictment said. Other scenarios included a fake 911 call to lure an officer to his or her death, or an attack on the family of a police officer. Once other officers gathered for a slain officer’s funeral, the group planned to detonate homemade bombs at the funeral, killing more, according to the indictment. “It is believed by the Hutaree that this engagement would then serve as a catalyst for a more wide-spread uprising against the government,” the indictment charges. Eight suspects have been arrested by the FBI, and one more is being sought. Of the eight captured, seven were arraigned Monday in Detroit and ordered held pending a bond hearing Wednesday. The charges against the eight include seditious conspiracy, possessing a firearm during a crime of violence, teaching the use of explosives, and attempting to use a weapon of mass destruction — homemade bombs. All seven defendants in court on Monday requested to be represented by the federal defender’s office. The case “is an example of radical and extremist fringe groups which can be found throughout our society. The FBI takes such extremist groups seriously, especially those who would target innocent citizens and the law enforcement officers who protect the citizens of the United States,” said Andrew Arena, head of the FBI’s field office in Detroit. Stone’s ex-wife, Donna Stone, told The Associated Press before the arraignments that her former husband was to blame for pulling her son into the Hutaree movement. She said David Brian Stone legally adopted her son, David Brian Stone Jr., who is among those indicted. She said the marriage lasted about 10 years. Another son of David Brian Stone, Joshua Matthew Stone, is also indicted and currently a fugitive, said Detroit FBI spokeswoman Sandra Berchtold. On its Web site, Hutaree quotes several Bible passages and states: “We believe that one day, as prophecy says, there will be an Anti-Christ. … Jesus wanted us to be ready to defend ourselves using the sword and stay alive using equipment.” There’s also a picture on the site of 17 camouflaged men, all holding large guns. The group didn’t return an e-mail sent by The Associated Press, and attempts by telephone to reach the Stones went unanswered. FBI agents in Michigan swarmed a rural, wooded property Saturday evening in Adrian, about 70 miles southwest of Detroit. That same night in Hammond, Ind., law enforcement agents flooded a neighborhood, startling workers at a nearby pizzeria. And in Ohio authorities blocked off streets and raided two homes. In Adrian, two ramshackle trailers sat side-by-side on the property, the door to one slightly ajar late Sunday as if it had been forced open. Phyllis Brugger, who has lived in the area for more than 30 years, said some people who lived there were known as having ties to militia. They would shoot guns and often wore camouflage, according to Brugger and her daughter, Heidi Wood. In Hammond, 18-year-old George Ponce, who works at a pizzeria next door to a home that was raided, said he and a few co-workers stepped outside for a break Saturday night and saw a swarm of law enforcement. Can anyone imagine Jesus, Peter, or Paul sanctioning a “Christian” militia? May God free us from the myths of redemptive violence! Speak Evil of No Man…Really?? Um…excuse me Paul? What were you thinking? Don’t you believe that evil exists in the world? Certainly when you talk about speaking evil of no man, you don’t mean to include people like Hitler, Stalin, Mao, and Pol Pot …or do you? Oh, wait a second. I almost forgot. You wrote these words when the homicidal maniac named Nero was doing some pretty crazy things, like impaling Christians and using them for torches. My bad. Still, couldn’t you have at least put in an exception clause for those that are really bad? Why does this verse annoy me so much? Because I’ve got some pretty strong political opinions. And what I think this verse is saying is that even if I believed that the presidency of Barack Obama represents the second coming of Chairman Mao or that Glenn Beck and Sarah Palin want to reduce the middle class to permanent serfdom, I’m still not supposed to speak evil of them. I can hear the half-screams already. You’re proof-texting! Certainly we need to speak against people that believe in killing unborn babies, that are in bed with Wall Street, that raise taxes, that cut social spending, that are steering our country on a path to socialism or—insert your political beef here. Very well then. My question to you is this. Is the person that you’re thinking about worse than Satan? According to Jude verses 8 and 9, Christians aren’t even supposed to bring a reviling accusation against Satan! And, by the way, the context of the passage in Jude is talking about those in authority—including political leaders. When Jesus spoke about loving enemies, He used the Heavenly Father as an example of someone who is “kind to the unthankful and evil” (Luke 6:35). Notice the word evil. Evil is a pretty strong word. It encompasses everything from your passive aggressive mother- in- law to the terrorism of Osama Bin Laden and—yes—to Barack Obama, Hillary Clinton, Sarah Palin, and Glen Beck depending on your political persuasion. It’s true that Jesus called the Pharisees “Brood of vipers!” (Matthew 23:33) but notice that He never called Caiaphas a snake. Jesus never made it personal. He attacked ideas, not people. Furthermore, if anyone would have qualified for the title of scumbag, it would have been Zacchaeus; the guy that was using his position with the Romans to screw the poor among his own people. Yet, how did Jesus treat Zacchaeus? He offered unconditional friendship to the man by inviting Himself to his house. Zacchaeus became a changed man (Luke 19:1-10). Heck, Jesus even called Judas His friend after the Scriptures specifically tell us that Judas became indwelt by Satan! (Matthew 26:50, Luke 22:3) Talk about seeing life through rose-colored glasses! I’m not saying that I have all the answers when it comes to reconciling this teaching with the idea that Christians are supposed to take a stand against injustice and “expose” the works of darkness (Ephesians 5:11). I’m just wondering what would happen if Christians worldwide became known as people that are so loving, so kind, so gracious, so humble, that they refuse to speak evil of people with whom they have deep disagreements? What if Christians became known as people that are—to quote the last part of the verse we started with—“peaceable and gentle, showing all humility to all men?” What if? Tim Wise is one of the nation’s premier anti-racist authors. Here is the latest article on his blog. Fair warning, Tim lets nobody off the hook. Washington, D.C. (March 23, 2010)–International Christian Concern (ICC) has learned that a Christian man, Arshed Masih, died yesterday after Muslims burned him alive for refusing to recant his faith. Additionally, a Muslim policeman raped Masih’s wife. Masih and his wife, Martha, worked and lived at the house of Sheik Mohammad Sultan, a powerful Muslim businessman in Rawalpindi, Pakistan, since 2005. Pakistan’s most powerful man, army chef General Ashfaq Pervez Kayani is from the Rawalpindi area and is visiting the U.S. capitol. In January, Muslim religious leaders and Sheik Sultan asked Masih and his family to convert to Islam. Masih and his family refused to convert and informed Sheik Sultan that they were going to quit working for him. The Sheik became furious and warned Masih that he would kill him if he quit. Masih told his family and friends about the entire incident. Christian leaders tried to persuade the Sheik to let Masih and his family leave his house. On March 14, Sheik Sultan`s house was robbed. He filed a case of theft of 500,000 Rupees ($ 5,952) against Martha. After taking them for questioning, the police assaulted Masih and raped Martha. Two days later, Sheik Sultan told the couple that he would ask the police to release them if they converted to Islam. The couple refused to recant their faith. On March 19, Masih was set on fire in front of the police station. At the time, three Muslim religious leaders and three policemen were present at the scene. The perpetrators have not been identified. Masih was taken to the Holy Family Hospital where he received treatment for three days before finally dying today. Masih’s children Mary, 12, Nasir, 10, and Neha, 7, are deeply traumatized after witnessing acts of brutality against their family at the hands of Muslims. Please call the Pakistani Embassy in your country and demand of the officials of Pakistan to thoroughly investigate the heinous crime committed against Masih and Martha and bring all the perpetrators to justice. David Kuo’s article "God Help Us"
I just found this article by David Kuo on the website Qideas. It’s a little long but well worth the read. David Kuo worked for the Bush White House. He later went on to write a book called Tempting Faith: An Inside Story of Political Seduction, a book I highly recommend. David is one of the rare evangelical voices calling on both sides of the political aisle to stop–my words, not his–pimping God to promote their political agendas. When I read the Book of Acts in the New Testament, I notice a stark contrast between the gospel that the Apostles preached and the gospel that is preached in many American churches today. America is a trendy nation. It seems that for every cultural trend there’s a gospel to fit that trend. How does the church react to a materialistic society? No problem! It’s called the “health and wealth” gospel. And the postmodern trend? No problem! There are gospels that emphasize “deconstruction” and “negative theology.” Sometimes I wonder what Peter, James, John, and Paul would think if they took a look at the books on the Christian best- seller lists today. Or what would they think of the “if you’re looking for meaning and fulfillment in your life, come to Jesus” altar calls? Will the real gospel please stand up? Here’s my proposition. What if instead of trying adapt the gospel to make it relevant to the culture, we proclaim the gospel as is and let the culture adapt to the gospel? What would that look like? 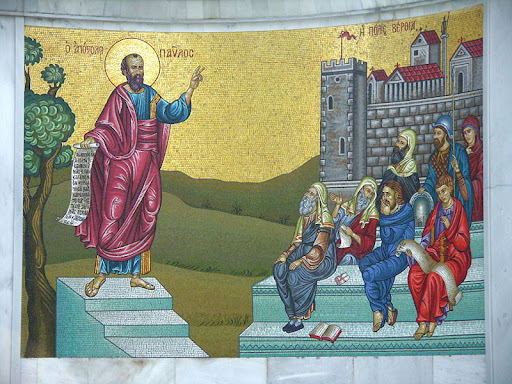 What are the essential elements that Jesus and the Apostles thought were necessary to qualify as a genuine gospel presentation? Why not just preach what the Apostles preached? After a careful study of the Book of Acts and the letters of Paul, I’ve come up with a succinct statement that I believe qualifies as the essence of the gospel. Since the word preach literally means “to herald” or “to announce”, think of this as Aaron D. Taylor’s official gospel press release. I wonder what would happen if the average American preacher used this kind of language when preaching the gospel? Some say that the average listener would fail to emotionally connect with straight Bible talk such as this. Maybe, maybe not. I don’t really know, but I suspect that even if that were true; God probably knew that when He inspired the New Testament. Maybe gospel language isn’t meant to be reduced to what we perceive our felt needs to be. Either way, I’ll take the real gospel over the best seller version any day. We affirm the foundational truth that God loves everyone (John 3:16). We affirm that as followers of Jesus Christ we are called to do justice and love mercy (Micah 6:8), to be ministers of reconciliation (2 Corinthians 5:11-21), and to be peacemakers (Matthew 5:9). We affirm that the Holy Spirit empowers followers of Jesus to speak and live humbly and prophetically (Acts 1:8). We recognize that this is the time to resolve the Israeli-Palestinian conflict. Therefore, we are convinced that the Holy Spirit is leading us at such a time as this to unite as Christians throughout the world in order to pray and work for a just peace in Israel and Palestine. To this end, we commit to reconnect with the local Palestinian church and to listen and learn from all those who follow Jesus in the Holy Land and to share their stories with our own faith communities. We further commit to work together to advocate changes in public policy and so achieve a just and lasting resolution of the conflict. Our vision and our hope is that Israelis and Palestinians will live in justice and peace in the land of the Holy One. A friend of mine sent me this video the other day. It’s called Prince of Peace God of War. I highly encourage you to watch it. The filmmaker, John Campea, interviews both Just War theorists and pacifists. My only criticism is–ironically– that the Just War side wasn’t adequately represented. Some of the arguments they presented were really grasping at straws, like using the story of Jesus cleansing the temple as a proof text that Jesus approved of His followers killing in war. Really??? Also, pay close attention to how Tony Campolo deals with the Nazi argument. The story he tells, which is the very last part of the film, is one of the most moving stories I’ve ever heard about the power of non-violent redemptive love identifying with the suffering of the world–the way of Jesus.